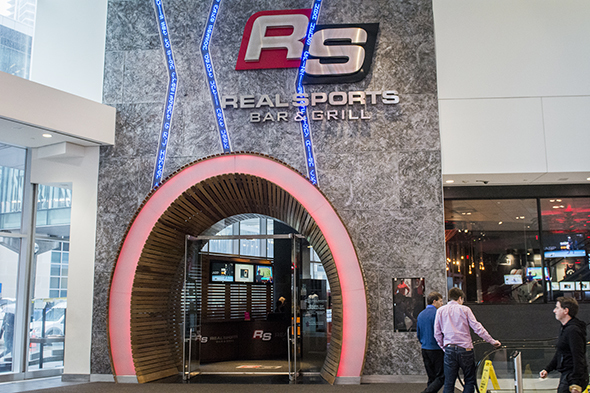 Real Sports Bar is Toronto's largest and busiest sports bar, part of the grouping of businesses connected to the ACC. Gigantic arching ceilings, inset lighting, and dark walls and furniture give that sports bar permanent sense of night, and the view of a huge screen from floor or balcony level is superb. They once had a colossal menu that focused more on epic hot dogs and the like but they've since evolved to a more concise menu that changes seasonally. The hot brisket ($24) feels like real pub food, the sort of thing I'd want to get at a sports bar. 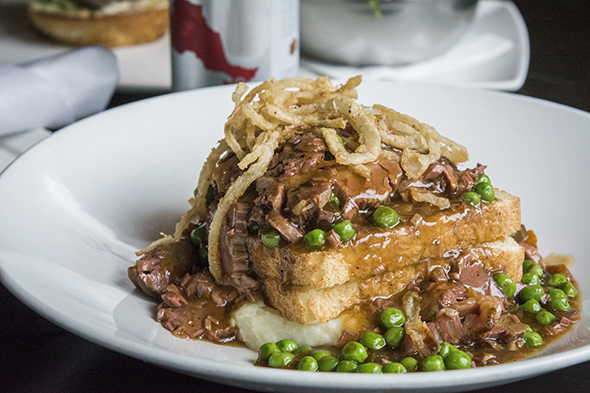 Fluffy mashed potatoes are topped with a white bread grilled cheese sandwich layered with rich smoked and braised sliced brisket, stout gravy, bright little green peas and sweet crispy onions. All the elements together create a comforting symphony of blunt but loveable flavours. 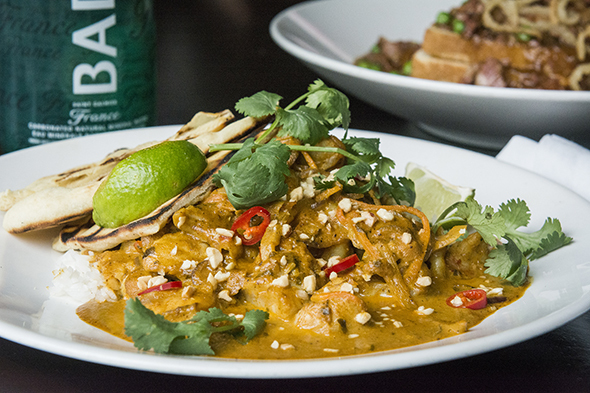 The seafood tikka masala ($20) is a mix of Oceanwise line caught perch and shrimp in a zesty, not-too-spicy masala curry on basmati rice with some grilled naan bread on the side. The bread isn't made in house or in a tandoor, but any bready substance will really do if the curry is decent, which it is, and it is grilled to order. They have five burgers all of which you can get on a lettuce bun, and this is the Prestige ($21), made with Ontario beef dry-aged for 45 to 60 days with a prosciutto fat cap ground in, topped with pecorino injected with truffle which lends that aromatic, woody, almost overpowering truffle flavour to the dish. 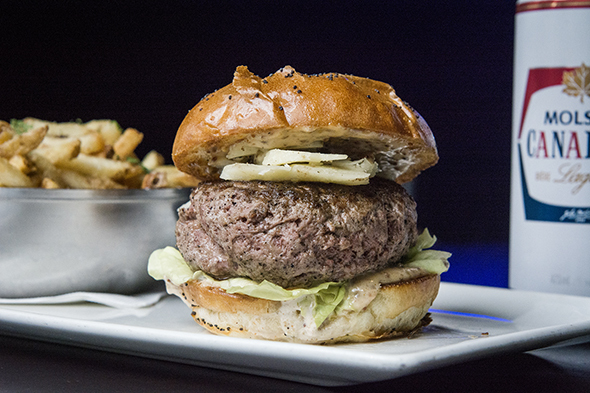 Burger buns are baked fresh daily and delivered to the restaurant. Burgers and sandwiches come with salad or fries, and I'd recommend the fries, made using a proper blanching, soaking and frying process to be crispy and just salty enough. 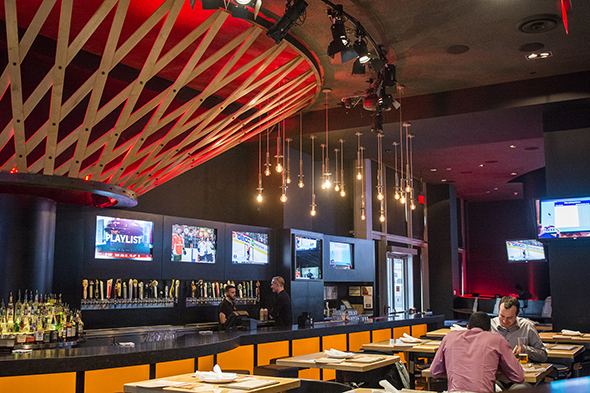 The space is humongous enough to hold all the hungry fans that might hit Real Sports Bar before or after a game, and even if you don't have a view of that giant screen there are dozens of TVs every which way you look.